I am a Research Assistant Professor at the Faculty of Science and Technology, NOVA University of Lisbon (FCT-NOVA), Portugal and an integrated member of the UCIBIO (Research Unit on Applied Molecular Biosciences, http://www.requimte.pt/ucibio/people/angelinapalma). I obtained my degree in Biochemistry in 2001 at University of Algarve, Portugal, and completed the PhD degree in Biochemistry in 2007 at NOVA University. At the Laboratory of Glycobiology, ITQB-NOVA, under the Supervision of Dr Julia Costa, I was trained in fundamentals of glycobiology and of glycosylation pathways in mammalian-, insect- and plant-cells, and learned about the important role of glycans and their recognition in all domains of life, and also in health and disease processes. I joined the Glycosciences Laboratory of Prof. Ten Feizi (Imperial College London), first as visiting scholar (2004-2005) during my PhD and thereafter as a post-doctoral fellow (2007-2009), funded by the Portuguese Foundation for Science and Technology (FCT). While at the Glycosciences Lab, I developed pioneering work in designer glycan microarray approaches to study glycan recognition systems of biological and biomedical impact and in the setting-up of a state-of-the-art glycan-microarray system and in its application to glycan-ligand discovery. During this period I was trained in fundamentals of glycan chemistry, lectin- and immune-recognition, and methods for glycan analysis, including mass spectrometry to structurally characterize glycans. At present, I am an Honorary Research Associate of Imperial College London, working with colleagues at the Glycosciences Lab in developing further the glycan microarray technology and its applications (http://www.imperial.ac.uk/people/apalma/). I returned to Portugal end 2009 and joined the protein crystallography group of Prof. Maria João Romão at FCT-NOVA (http://sites.fct.unl.pt/xtal/pages/members). Here I implemented the glycan microarray technology combined with X-Ray crystallography to study endogenous lectin recognition systems (e.g. malectin, Dectin-1) and microbial glycan degradation of complex polysaccharides (bacterial cellulossomes). In 2013, I was awarded a 5-year Starting Grant under the highly competitive FCT Investigator international call, which allowed me to start my independent journey as a group leader and set-up the GlycoLAb – Functional Glycobiology Laboratory. As PI at FCT-NOVA, I was given the conditions to set-up a glycan microarray laboratory, supported by 2 research project grants from Portuguese FCT. This enabled me to train Master and PhD students in Glycosciences and establish a line of research in Functional Glycobiology at UCIBIO. Since 2010, I have been enrolled in teaching Biochemistry and Metabolism at the Biochemistry Section of the Department of Chemistry at FCT-NOVA. I have also started teaching and training in Glycosciences to Master and Doctoral Programs within our Faculty and across Faculties and I am a scientific advisor and teacher of the e-learning course Glycobiology and Glycochemistry (http://www.fcm.citi-learning.info/moodle/course/view.php?id=2). I hope to implement the Glycosciences discipline in the undergraduate and postgraduate teaching programs of the Chemistry and Life Sciences Departments at FCT-NOVA. With this vision, and with colleagues from these departments, I started in 2017 the Curricular Unit Glycobiology and Disease, which is given to the Master programmes in Biochemistry, Biochemistry for Health and Molecular Genetics and Biomedicine of FCT-NOVA. Glycans are present in all living cells and organisms, and their crucial roles and functions are as diverse as: acting as structural components for cell integrity or in regulating physiological and pathological processes, e.g., signalling, cell-cell communication, immune-recognition, host-pathogen interactions, protein folding and quality control). Although it is recognised by the scientific community that glycans represent a largely undiscovered resource for biological functions as well as for novel therapeutic opportunities, their study and the study of glycan-binding proteins has been hampered by several challenges. Among these are the following: 1) glycans have highly heterogeneous sequences; 2) are difficult to isolate from natural sources in sufficient amounts for characterization by conventional methods, and 3) the glycan-protein interaction is in general of low affinity. But these studies are being revolutionised by the advent of the highly sensitive and miniaturised glycan microarray technology, whereby sequence-defined glycan probes are robotically printed on solid supports as microspots (enclosed Figure). 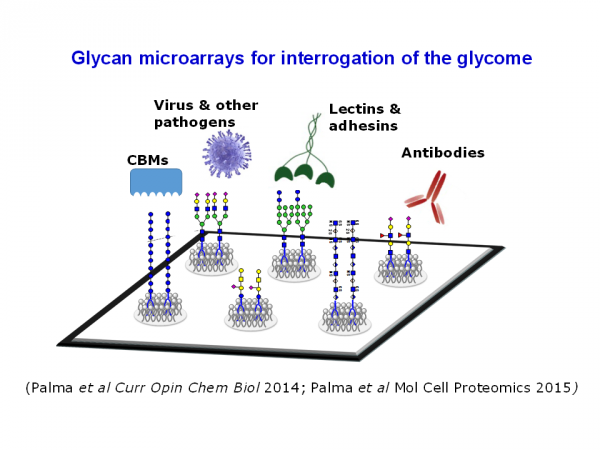 Glycan microarrays have proven to be powerful high-throughput screening tools for discovering glycan ligands and their function and evaluating specificities of glycan-binding proteins; also for assignment of functional glycan ligands in pathogen-host interactions. Despite the great advances in the glycan microarray field, its continuous development is essential, for example for studies of microbe-host interactions or to target specific mammalian or microbial glycomes. As the desired glycans that are relevant in those particular biological contexts are unavailable, it is critical to generate microarrays from biologically relevant ligand-bearing glycoconjugates, in order to reveal the oligosaccharide ligands they harbour, so that these can be isolated and characterised. This is the concept of our designer microarray approach. The focus of my research is on developing glycome-based designer glycan microarrays for interrogating glycomes and proteomes leading to: 1) glycan ligand discovery and function; and 2) unraveling of glycan-recogniton systems. These are applied to study endogenous and microbial glycan recognition systems and glycan-mediated pathogen-host interactions. I am following structure-function integrative approaches combining glycan-microarrays with complementary methodologies such as X-Ray crystallography, NMR and other biophysical techniques such as ITC, to characterize the interaction. - Neu, U., Mahmood Khan, Z., Schuch, B., Palma, A.S., Liu, Y., Pawlita, M., Feizi, T., Stehle, T. “Structures of B-Lymphotropic Polyomavirus VP1 in complex with oligosaccharide ligands” PLoS Pathog 9:e1003714, 2013. - Palma, A.S., Feizi, T., Zhang, Y., Stoll, M.S., Lawson, A.M., Díaz-Rodríguez, E., Campanero-Rhodes, M.A., Costa, J., Gordon, S., Brown, G.D. and Chai, W. “Ligands for the beta-glucan receptor, dectin-1, assigned using ‘designer’ microarrays of oligosaccharide probes (neoglycolipids) generated from glucan polysaccharides”. J Biol Chem 281: 5771-5779, 2006 (#170). - Palma, A.S.*, Feizi, T., Childs, R.A, Chai, W. and Liu, Y. “The neoglycolipid (NGL)-based oligosaccharide microarray system poised to decipher the meta-glycome”. Curr Opin Chem Biol, 18, 87-94, 2014.